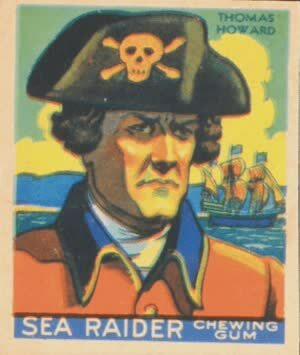 Thomas Howard was a famous pirate that was active on the first Pirate Round and served under both George Booth and John Bowen. Not much about Thomas Howard's early life is known, much like most of the pirates and privateers of the Golden Age of Piracy. However, it is known he arrived in British Jamaica in 1698 after spending his inheritance and hoped to gain a vast fortune through privateering or pirating. He joined a small group of pirates who began by stealing a small canoe and eventually worked their way up eventually to a 24-gun ship. Howard was elected quartermaster of the crew and they began attacking ships off the coast of British North America during the rest of 1698. After plundering the British colonies on the eastern seaboard the pirates elected to cross the Atlantic and raid the west coast of Africa during 1699. As they completed the first Pirate Round and neared the pirate haven of Madagascar they spotted a ship that had run aground on a reef. They quickly conquered the ship and began sailing throughout the Indian Ocean. Shortly after conquering the prize off the coast of Madagascar, Thomas Howard was marooned by his crew for unknown reasons while hunting. He was rescued by the pirate George Booth in early 1701 and served alongside John Bowen aboard their ship the Speaker. Howard would remain with the crew even after Booth's death while trying to negotiate with locals for supplies at Zanzibar and would sail with Bowen who was elected the new captain. He was later stranded on the Speaker when it ran around on Saint Augustine's reef and relocated to the nearby island of Ile de France, also known as Mauritius. After settling down for a short period of time Howard would recruit a new crew of pirates and became captain of the 36-gun ship the Prosperous. Near Christmas of 1702 he was elected captain of the ship and met up with John Bowen again at the port of Mayotta. Joining forces the two then captured an East India ship named the Pembroke in March of 1703 off Johanna Island in the Comoro Islands. The two would split up for a short period of time following this and Bowen took his crew to help careen his ship the Speedy Return for a few months. Bowen and Howard would meet up again in August of 1703 where they captured two Indian ships worth about £70,000. Taking one of the massive Indian ships as their new flagship the crews of Howard and Bowen merged at this point and took control of the 56-gun ship they named the Defiant. Bowen took command of the new prize and they sailed to the port of Rajapura to divide the treasure and party in the way only pirates know how. "A most ill natur'd Fellow, and using her ill, he was murder'd by her Relations"
Overall Thomas Howard is not a well known pirate but his significance in the story of John Bowen is essential in understanding the prosperity of the pirates in the Indian Ocean. Even with the few prizes that the pirates took during the Pirate Round they scored much larger than their counterparts in the West Indies who were mostly robbing basic trade goods.